Mailboxes are great for the office, the classroom, and of course for your home. They are perfect for your mail and they make wonderful gifts for family, friends, and employees. People nowadays are using mailboxes for all kinds of things. For my daughters wedding we designed, painted, and took hers to her shower and to her actual wedding. It held her wedding cards perfectly and later she put it to good use at her new home. 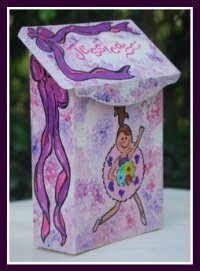 I individually hand paint every box with your name, address and/or any type of personalization you might want. I include this at no extra cost to you. You will like these items because they allow your individual personality to come through, while you express yourself where you work, where you sleep or on the outside of your home. It is a brilliant piece of "Garden Art"
I have quite a collection and I post new designs as I paint them. If you need a custom design like a mascot, logo, or special icon just include the picture with your order. Please take a look in the Goodies Store... Page 5 . If you have any questions just e-mail or call. I know that you and I can find somthing that you will like. With a Hand Painted item like this, you will be the talk of the neighborhood or the envy of your co-workers. All of the mailboxes that I paint are unique and make a wonderful gift for you or someone special. I enjoy designing and painting them. Sometimes my daughter comes by and helps me paint. She is much faster than I am. Oh well, life is sweet. I started personalizing them when a teacher asked if I would paint one for her classroom. She wanted to put it on her door so that the students could leave her notes when she wasn't there. She wanted her name on it and a reading theme, because reading is what she taught. Of course when the other teachers saw it they all wanted one too. They really did turn out cute. I still paint the small boxes, but I also have the larger ones too. They come in your basic black, white, or silver. Then, I use acrylic paint for all my designs. They are then sprayed with a clear varnish that doesn't yellow. So,if you want to fancy up your neighborhood with some nice curb appeal, if your looking for something pretty to set on the front porch, or if you need that special something to dress up your office. Go ahead and take a look in the Goodies Store... Page 5. I'm sure you will find something that interests you.